I used to feed pigeons on the roof of my building, but I had to stop due to landlord complaints, and the expense. The pigeons would wait for me every day and it broke my heart when I knew they’d be waiting in vain. Sob. 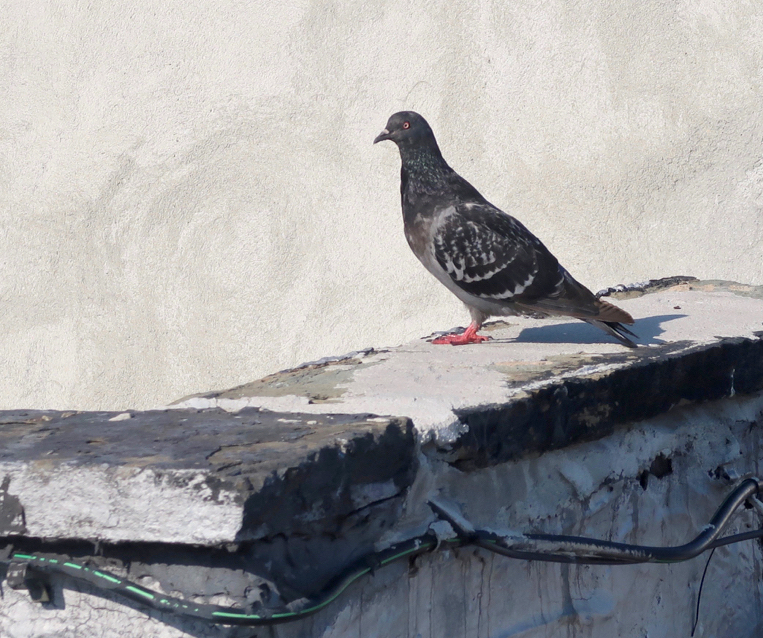 I took this picture of a pigeon on my roof a couple of weeks ago and I thought I had already posted it. I love it because it looks like a painting. Oh yes, a nice painting, I agree. Those orange “feet” would be such a focal point I think. Plus he/she looks so regal! Flying through the air must be bliss! I’d be crying too if I knew they were waiting for their dinner and you’re a no show! But I guess you can’t take on such a big responsibility in a city setting where there are hundreds of them and only one of you. 🙂 They found other resources I’m sure. That’s what I tell myself. Life is hard for people and for pigeons.